There are a lot of beading threads out on the market; plenty of options, depending on what you need. Let’s talk about some of the pros and cons of each of the three main types of threads used in bead weaving stitches. The three main types I will talk about today are Nymo, Silamide and Fireline. Nymo thread was the first beading thread I used, and I used it for many years. 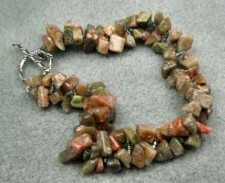 The pros are that it comes in various diameters, depending on what size beads you are using, and quite a few different colors. It’s fairly strong (the name Nymo comes from nylon monofiliament), and easy to tie off. It’s also the least expensive of the three threads (around $2 for about 120 yards). The cons are that is frays easily and tangles badly (although using beeswax or thread heaven helps a great deal with the tangles). 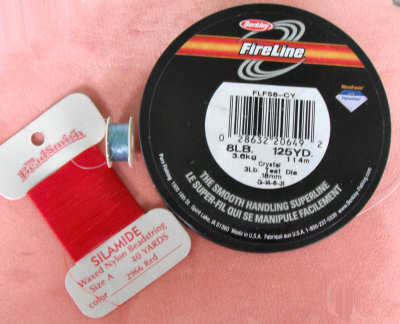 Silamide is a multi-ply thread, unlike Nymo. I mostly see it in 2-ply, which is 2 threads tightly twisted together. It comes pre-waxed, so it’s not quite as tangly as Nymo. If thread color is something important to your project, Silamide has more colors available than Nymo; you’re far more likely to find just the shade you need. The downside of using this thread is that there is little variety for thread diameter, although it seems to work fine with Delicas and up. I wouldn’t try it if I had a project where I had multiple passes through a size 15 seed bead, though. It also is difficult (for me anyway) to thread onto the needle, due to it being multi-ply. And it does fray, although not quite as badly as Nymo. The cost is more than Nymo, as Silamide is around $2 for 40 yards. Fireline isn’t really a thread so much as fishing line! Or at least that’s how it started out. Then beaders discovered it and now it’s usually the thread of choice for many. The upside is that it doesn’t fray, is very strong and comes in plenty of diameters. It does tangle if you’re using long lengths of thread, but the tangles are easy to undo. When you see Fireline offered for sale, you’ll see it marked in pounds. It starts at 1-lb and moves up through 80-lb (maybe more). The sizes for bead weaving are mostly 4-lb and 6-lb. I mostly use 6-lb, but I also have both 4-lb and 8-lb that I use, depending on my project needs. If I wanted to use a double thread on my project, I’d pick 2-lb or 3-lb for size 11 and larger beads. Fireline is the most expensive of the threads, although it pays for itself in peace-of-mind (like I said, it’s very strong). The cost is about $10 for 50 yards. I buy it only on ebay, on account of the fact that it’s the best price there. I’ve also snagged great auction prices, where I got multiple spools for the price of a single spool – my best so far was 4 spools, 125 yards per spool, for $20 total (including shipping)! So which beading thread should you use? It all depends on your project and how much you have in your beading budget to spend on thread. I have a list of quite a few of the beading threads and for what projects you may want to use them for — here’s the video.